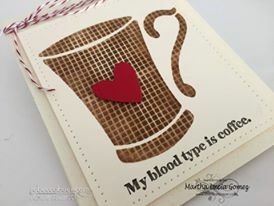 Hello everyone, Martha Lucia here to share with you a fun technique using simple layers of the stencils. As you noted some of the Rebecca Baer Stencil Designs come in two layers, simple and detailed, you can use them alone or combined in your creations. Today I will share with you a tip to use only the simple layer to create a special texture. Take a Very Vanilla piece of card stock and the simple layer of your stencil. Secure both pieces using the Mini Masking Tape. Start by applying the distress ink using the blending tool. Mark the borders and keep the center clear. 2. Take the wall repair tape or the Cross-Stitch Screen and put over the stencil. 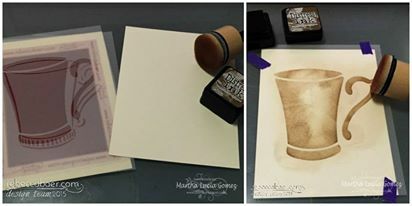 Using the blending tool apply the same color of distress ink but don't rub over the paper, just press firmly. Then remove the the screen and the stencil and stamp the sentiment using another color of ink. 3. 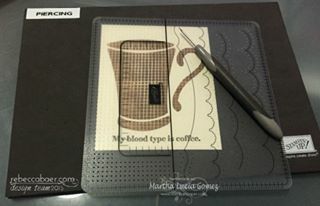 Using the piercing tools create a dot border around of the paper. 4. 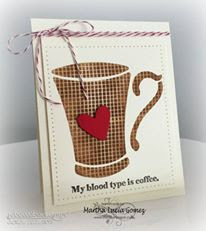 Paste this layer over the card base using dimensionals and decorate with a die cut heart and some loops of baker's twine. You can try this technique with different textures and colors. This looks great with stencils that have big open areas.